In the board game Chaosmos, the Chaos Clock counts down to the complete collapse of the universe. Hidden on some desolate planet protected by traps and trickery is an artifact that can save the cosmos — but you're not the only one after it. Chaosmos is an original board game in which players play aliens traveling the universe seeking an artifact called the Ovoid. using a clever system of hidden cards and envelopes, the Ovoid is hidden in among traps weapons and strange devices you can use to waylay the other players. The game's ongoing Kickstarter has already warped past their initial goal. As a huge fan of space intrigue games, I'm pretty excited about this one. I highly suggest watching their intro video — the excitement of the playtesters is downright infectious. Lead designer Joey Vigour answered all my questions about Chaosmos, how it works, and what inspired it. io9: Tell me about Chaosmos – what are the players trying to accomplish? How do they go about it – or maybe more to the point, how do they prevent each other from accomplishing things? JV: The universe is collapsing, and all the alien civilizations are scrambling to locate and acquire the greatest and most singular object in the history of the Biocosm… the Ovoid. In Chaosmos, you play as an alien tasked with recovering this mysterious artifact that is rumored to save your race from doom. In order to find and protect the Ovoid, you'll explore planets, gathering weapons, booby traps, and other gear that you'll have to find inventive uses for. Smart players will trick their enemies with bluffing and deception, sending their opponents on false trails, while obscuring their own plans. The Chaos Clock counts down to the destruction of the universe, and when it hits zero, whoever has the Ovoid in their hand becomes master of the new universe! io9: What are some of the games or game mechanics that inspired the design of Chaosmos? JV: Cosmic Encounter features unique player powers and opportunities for a lot of player interaction and psychological tricks. We drew inspiration from Cosmic when creating our aliens with unique, game-breaking special abilities, and each of our aliens' powers relates to their personality and backstory. Twilight Imperium is a fantastic empire-building game and although our game is totally different, we were inspired by the concept of landing markers/flags, and by the notion of a modular board that is different every time. io9: Which sci-fi books, movies or series inspired the world of Chaosmos? JV: Chaosmos is very unique for a board game, since the biggest inspiration for it came from a sci-fi novel rather than from other games. Interstellar Pig, written by William Sleator, features a boy drawn into an intergalactic battle through a strange board game he plays with curious strangers while on vacation. Some of the ideas from Chaosmos were my own interpretation of the fictional game in that book. It slowly evolved into a whole game system with innovative mechanics and a lot of strategic depth. io9: A lot of otherwise great games end up having that "fishbowl" feeling, where each player is gathering resources and not really interacting with each other in meaningful ways. How much interaction is there in this game? JV: Chaosmos has a huge amount of player interaction! You're dropped into a sandbox and given a great deal of freedom how to spend your turns, but player-player interaction is always the focus. Finding the Ovoid usually means thwarting other players' traps and vaults, or facing off against them in combat to steal things. Protecting the Ovoid requires deft maneuvering around your enemies to prevent them from discovering your hiding place. You can also gather counters to your opponents' weapons, pick up enviro-gear to lay an ambush on a planet toxic to you, or hyperspace to an opponent's planet and claw the Ovoid from their impenetrable base. While you try to guess and adapt to the other players' strategies, they're doing the same to you! io9: Describe for me a typical turn – what actions can a player take? What might happen? JV: The core actions in Chaosmos consist of movement, taking control of planets, and attacking other players. If you start your turn on a planet, you might spend two actions to move to the next planet, play a card that lets you steal control of the planet from your opponent, open their vault with a key, and then use your last action to attack them with all the weapons you just stole! Throughout the game, there's a cold war version of "capture the flag" happening with the Ovoid card, as players hide it or steal it from planets and each other. io9: One of your stretch goals is a hex-based modular game board. How will that change the overall design? Does that leave you more room for expansions? JV: We have been planning a modular board for quite some time, testing and refining it alongside our traditional board. We're excited to announce the modular board, which will improve the gameplay of Chaosmos and make it infinitely more replayable. 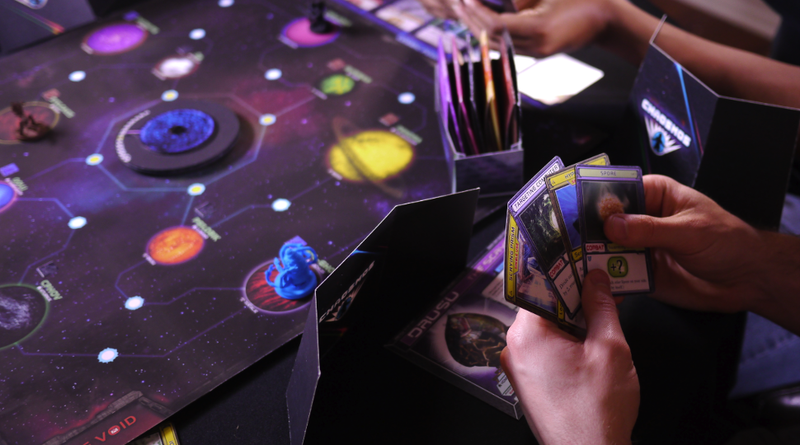 A modular board means players can customize the layout of the planets and wormholes each game, ensuring a different experience every time. It also leaves Chaosmos wide open for expansions, which can offer new aliens alongside new board hexes that can be seamlessly integrated into the experience. It's an incredible change to the game and we're excited to unlock it as a stretch goal! io9: I've become a really big fan of emergent story-telling. What kinds of stories come out of Chaosmos games? Any that stand out from playtesting? JV: Chaosmos naturally fosters emergent narrative by offering a huge amount of player choice, as well as cards that combine in an endless number of ways. There's no imposed path to victory in Chaosmos, and you're not awarded points for following a particular strategy. Players can experiment and adapt their strategy to the situation, which naturally encourages a wide variety of game stories. In one of our favorite games, the Ovoid had been locked in a vault on Oolu, and eventually everyone discovered it was there. Most of us collected powerful equipment for the final battle, but nobody could find a key to unlock the vault and take the Ovoid. Ben remained in the shadows most of the game, searching for a key, but didn't have much else. While the other three players sat on Oolu with stacks of weapons, waiting for Ben to get there so they could take the key and fight over the Ovoid, Ben landed on Oolu and used the Claw of Sykloakis to steal one card out of the planet. Instead of taking the Ovoid and facing the wrath of his opponents, he grabbed the Guerrilla Drop Capsule, which allowed him to take control of the whole planet, used his key to unlock the vault, and then stole the Ovoid and then the Temporal Displacer to time travel forward 8 turns and win the game. Chaosmos is ultimately a story about the Ovoid, and players individually experience only a part of its journey. After the game ends, it's common to see players talking excitedly about what happened – where the Ovoid started, what happened to it, and how it made its trek across space and time into the winner's hand. All their secret strategies are revealed as players connect the dots and reconstruct the path of the Ovoid. That's what makes Chaosmos a great narrative experience, and makes every game different from the last.